I have a very low tolerance for Quentin Tarantino at the best of times. All style, little content and remarkably overrated as a director, so the accolades showered upon his two part revenge movie left me utterly perplexed. ‘QT’ is the best example there is of what can go wrong when you put a movie geek behind the camera, and he’s been fortunate to find producers willing to pay him to remake all his favourite movie scenes. 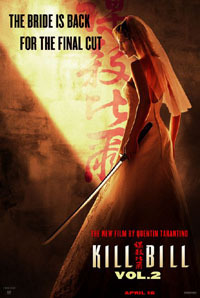 Kill Bill was the ultimate in misguided fan-boy filmmaking. Uma Thurman does a good job in the lead but the story is hackneyed, the dialogue is overcooked and where there should be emotional punch there is just the constant desire to appear cool. Kill Bill is an empty, soulless experience, generously garnished with one of the most irritating soundtracks in movie history. Someone needs to remind Tarantino that there’s a reason why people stopped making movies the way they did in the 70s, and that the ability to imitate outdated crash zooms does not make you an auteur. Until Sherlock Holmes allowed him some redemption, I found Guy Ritchie movies thoroughly irritating. 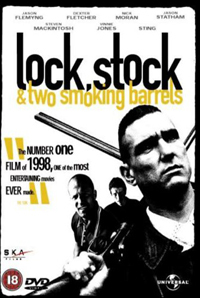 Lock, Stock and Two Smoking Barrels was hailed as a shot in the arm for British cinema, but the last thing British cinema needed was another gangster movie. British cinema needed Danny Boyle, and the spark he brought with Trainspotting. It needed to show that it wasn’t just limited to two things; period dramas and gangster movies. Then along comes Lock, Stock and Two Smoking Barrels and suddenly all we are making are more cockney gangster films. Yawn. Behind all the hype is a film that’s nowhere near as clever or funny as it thinks it is. Perhaps seeing himself as an English Tarantino, Ritchie certainly makes all the same mistakes; choosing style over content, two-dimensional characters and desperation to prove how cool he is. However, all these things pale into insignificance against the movie’s must heinous crime; launching the screen careers of Jason Statham and ex-footballer Vinnie Jones. Thanks so much, Guy. There aren’t very many musicals that I like. Grease, The Blues Brothers and The Nightmare Before Christmas are about it, I’m afraid. As a genre, I find the musical a frustrating one and difficult to relate to. So any musical that I can actually bring myself to watch has to be exceptional to defy my expectations. Conversely, it also has to be appalling to fall below them, but along came Moulin Rouge and fell way below. The success of Baz Luhrmann’s third movie is a mystery to me. You could spend years explaining it to me and I’d still regard you with bemusement. Almost everything about this movie fails to work. The use of contemporary pop songs in the period setting is all very post-modern, but it’s too jarring. Ewan McGregor doesn’t sing too well, Nicole Kidman is not a natural comedienne, and the threadbare story could comfortably fill a half-hour. Yes, it is gorgeous to look at and visually it can’t be faulted, but no more than that. 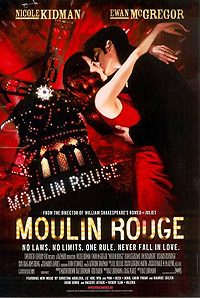 Moulin Rouge is like a cross between a karaoke night and a Michael Bay movie. It’s loud, shallow and feels like being hit repeatedly in the face. Stanley Kubrick’s big screen version of Stephen King’s book is often held up as one of the finest horror movies ever made, by one of the greatest directors who ever lived. While the latter statement is certainly debatable, I’ll limit myself to the former. The Shining is not a bad film, but it is a bad adaptation and a bad horror movie. While it is heavy on atmosphere, The Shining is never scary, and some of this is down to Kubrick’s inherent inability to find the emotional core of his movies. Often accused of making cold and clinical pictures, Kubrick was certainly guilty in this case. With no emotional connection to the characters and story, the fear of their peril is greatly diminished. Also, the role of Jack Torrence was woefully miscast in the form of Jack Nicholson. The book’s depiction of the slow disintegration into madness of an ordinary man was doomed from the moment Nicholson, who is far from ordinary, walked on set. This Jack Torrance seems a little unhinged from the start, and when he finally begins rampaging around with his axe, he is so over the top that he becomes comical rather than scary. 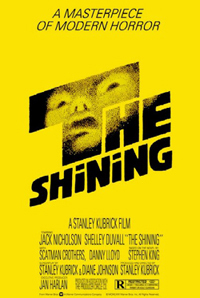 Beautifully shot it may be, but The Shining ultimately fails on all the points which are relevant to the genre. The story of the Titanic is certainly one of modern history’s most compelling; a true life cautionary tale of the hubris and arrogance of man. It was a story just waiting for a new big budget version, for someone to tell the story as it happened. What it wasn’t waiting for was the addition of a fictional, tedious and predictable love story, a crap Celine Dion song and Cameron’s brand of stick-figure morality (rich people are bad, poor people are good, etc). Utilising Leonardo Di Caprio at the height of his teeny popularity, Cameron was able to pull in more baby-sitting money than all three Twilight movies, but did his by-the-numbers doomed romance with Kate Winslet really need to drag on for over three hours? 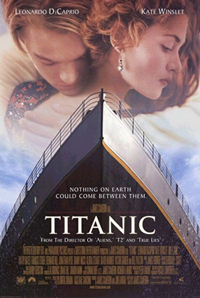 Cameron spent years preparing and researching this movie and yet Titanic teaches us nothing about the tragic events beyond the few commonly known facts. It’s just my opinion, but if you’re going to make a movie about a real life disaster, don’t make it play second fiddle to a half-assed chick flick. You end up doing the real story a disservice. 1958’s A Night to Remember still remains the best movie made about the ill-fated ship. This entry was posted in Top Lists and tagged A Night To Remember, Avatar, Baz Luhrmann, Celine Dion, Easy Rider, Ewan McGregor, Forrest Gump, Guy Ritchie, Jack Nicholson, James Cameron, Kate Winslet, Kill Bill, Leonardo Di Caprio, Lock Stock, Love Actually, Moulin Rouge, Nicole Kidman, Overrated Movie, Quentin Tarantino, Stanley Kubrick, Stephen King, The Shining, There Will Be Blood, Titanic, Top Five, Uma Thurman on July 24, 2010 by CZombie.